By its very design, Reston is a self-contained community, balancing living space with recreation, open spaces, appropriate commercial development and more. Add to that the wide variety of activities and programs available — as well as the broader resources available in our surrounding area, and it’s easy to see that you’ll never run out of things to do and places to explore. Reston is part of the New Town movement and was designed to stress quality of life for its residents. The idea of the community is that people could live here throughout many stages of life and take advantage of different housing options as they age. "Restonians" can live, work, and have recreation in their own community, with common grounds and scenic beauty shared equally. Amenities & Landmarks: Living in Reston is like living in a park. Over 1,350 acres of open space are maintained throughout the community, and a wide variety of facilities and programs offer year-round opportunities for fitness, fun and exploration. 55 miles of paved pathways and natural surface trails connect our facilities, neighborhoods, schools and shopping, and are perfect for walkers, joggers and bicyclists. More than 700 acres of forest, 50 meadows, and four wetlands provide beautiful vistas and important habitat for local wildlife. Aquatic habitats include four lakes, three ponds and 20 miles of streams, enjoyed by boaters and anglers. From Reston’s 15 different pools, patrons can swim laps in our Olympic sized pool, splash in the children’s interactive area, speed down a giant slide or relax in heated spas. Reston’s vibrant tennis community plays on 52 community courts. Eight are clay and 26 are lighted. These include six smaller-sized Quickstart courts for kids 10 and under. Friends and teams practice and compete on ball fields and multipurpose courts. Playgrounds, garden plots, picnic facilities and community buildings are popular places to gather and enjoy. Since its inception, Reston has integrated residential areas with retail creating inviting village center environments for shoppers and residents, alike. These village centers are in walking distance for many "Restonians", providing an easy access to retail and dining. Reston boasts a handful of village centers including North Point, Lake Anne, South Lakes, Tall Oaks, and Hunters Woods. In addition to Reston’s village centers, Plaza America, Reston Town Center, and the Spectrum at Reston Town Center are very popular attractions for all ages. Not only is Reston Town Center the home of many fine restaurants and shops, there is also a movie theater, and an outside amphitheater that converts into an ice skating rink in the winter. Other nearby indoor malls include Dulles Town Center, Fair Oaks Mall and Tysons Corner. Economy:Reston is the second largest office market in Fairfax County with almost 19.7 million square feet of space. Office buildings range from condominiums to the high-rise structures around the Reston Town Center. Other selected business parks in Reston include Campus Commons, Commerce Executive Park, Isaac Newton Square, Lake Fairfax Business Center and Parkridge. Reston is home to major employers such as Accenture, BAE Systems, Fannie Mae, the corporate headquarters of Lafarge North America, Lockheed Martin, Sprint, Northrop Grumman, Oracle, Qinetiq North America, Raytheon, Sallie Mae, Siebel Systems, Unisys and the U.S. Geological Survey. Getting Around:Reston is a 10-mile drive from Tysons Corner and the Capital Beltway to the east, and Washington Dulles International Airport to the west. Reston has four local exits on the Dulles Toll Road. Direct access to and from the airport is free. The Metropolitan Washington Airports Authority (MWAA) is constructing a 23-mile extension of the existing Metrorail system, which will be operated by the Washington Metropolitan Area Transit Authority from East Falls Church to Washington Dulles International Airport west to Ashburn. Included in this extension of the new Silver Line are 2 stations located in Reston. The first is near Wiehle Avenue/Dulles Toll Road interchange, Wiehle–Reston East, and the second will be at the Reston Parkway/Dulles Toll Road interchange, Reston Town Center. A third station (Herndon) will straddle the Herndon/Reston border at the existing Herndon Monroe transit hub. Fairfax County provides several commuter express buses from free park-and-ride lots to the West Falls Church Metro station. The Reston Internal Bus System is a set of five routes that circulate within the community, using Reston Town Center as a transfer point. The fare system is the same as that of Fairfax Connector. RIBS has been operated for 20 years by Fairfax County’s Fairfax Connector bus service. Metrobus service is available to Washington Dulles International Airport from the Herndon Monroe Park and Ride (which is located in Reston), and it is also possible to take routes to the West Falls Church station, which then connects with Ronald Reagan Washington National Airport. Twelve percent of Reston citizens use a method other than car to commute to work. Five percent work from home. Two percent take the bus. Because it is a planned community, Reston has many walking trails throughout. Bicycles are also permitted on the trails. History:The land on which Reston sits was initially owned by Lord Fairfax during the 18th century. C.A. Wiehle (for whom Wiehle Avenue is named) bought the land later in the 1880s. He died after construction of several buildings. His sons did not share his vision, and sold the land to A. Smith Bowman, who built a bourbon distillery on the site while maintaining a farm on most of the area, a 7,300-acre (30 km2) tract. An office retail development and a road are named for him. In 1961, Robert E. Simon bought most of the land, except for 60 acres (240,000 m2) on which the Bowman distillery continued to operate until 1987. 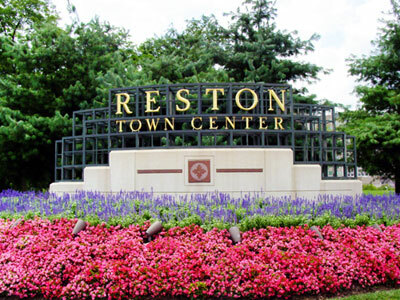 Reston was conceived as a planned community by Robert E. Simon. Founded on April 10, 1964 (Simon’s 50th birthday) and named for his initials, it was the first modern, post-warplanned community in America, sparking a revival of the planned community concept. Simon’s family had recently sold Carnegie Hall, and Simon used the funds to create Reston. Simon hired Conklin Rossant Architects as master planners to incorporate higher density housing to conserve open space, as well as mixed use areas for industry, business, recreation, education, and housing.